So technically the first day of summer isn’t until June 21. But it’s going to be 107 degrees here today, so I think it’s safe to say summer is already in full swing. Even when I lived in cooler climates, I always considered the entire month of June to be summer. Basically, once Memorial Day hits and that first BBQ’ing and boating day rolls around, it’s summer. School’s out… it’s summer. So happy summer, everyone! Even if it’s not quite official yet. What are your favorite things about summer? I have lots. The beach. Boats. Barbecues. The fact that it stays light out for so long. Flip-flops. Iced coffee. Dining al fresco. The local strawberry stand. There are too many great things about summer. It’s always been my favorite season, especially when I lived in places with real winters. Real winters make summer so much sweeter. This week I got to enjoy three of my summer favorites all together. I hit up the local strawberry stand for some fresh juicy berries and made myself some amazing fresh Strawberry Banana Pancakes. 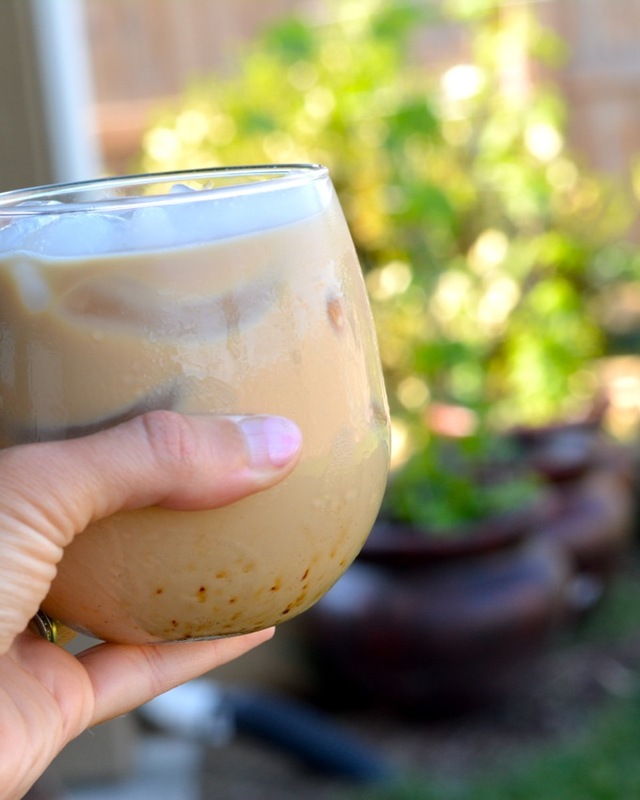 Then I enjoyed them on my back patio with a nice cold Folgers® Iced Café coffee. Since the weather’s been so hot here, the best times to eat outdoors are late dinners after the sun has mostly gone down, and in the morning before it warms up too much. I’ve been loving eating my breakfast with the birds. I first told you guys about my favorite super convenient way to make iced coffee a few months ago. 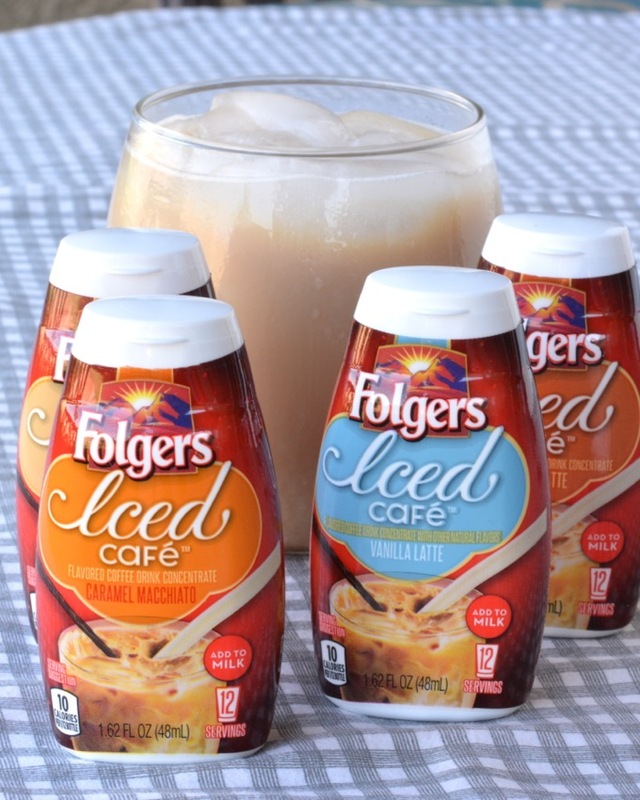 I’ve been really digging the Folgers® Iced Café (especially the Hazelnut Latte!!) this summer. It’s such an easy way to make an iced coffee lickety split, to enjoy at home or on the way out the door. Folgers® Iced Café is essentially just really concentrated sweetened coffee. All you have to do is squeeze a few squirts into a glass of cold milk (with or without ice) and you have an instant chilled latte– just as delicious as one you’d buy at the coffee shop. They come in several flavors including Original Latte, Hazelnut Latte, Vanilla Latte and Caramel Macchiato. They come in small, portable bottles so you can take them along and make your iced coffee wherever you can grab a glass of milk. I like them because I don’t have to brew coffee in the morning and wait for it to cool. 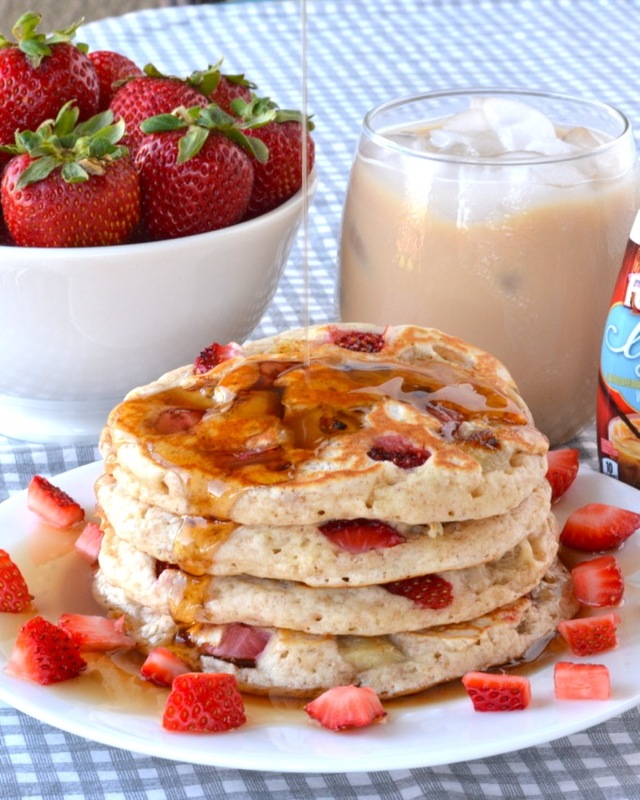 I can just whip up an Iced Café and then get busy on making breakfast– like these delicious pancakes. These pancakes are twist on my dad’s perfect pancake recipe. I swapped out a little of the regular flour for whole wheat to give them a little extra staying power. Then of course I added loads of fresh strawberries and bananas. 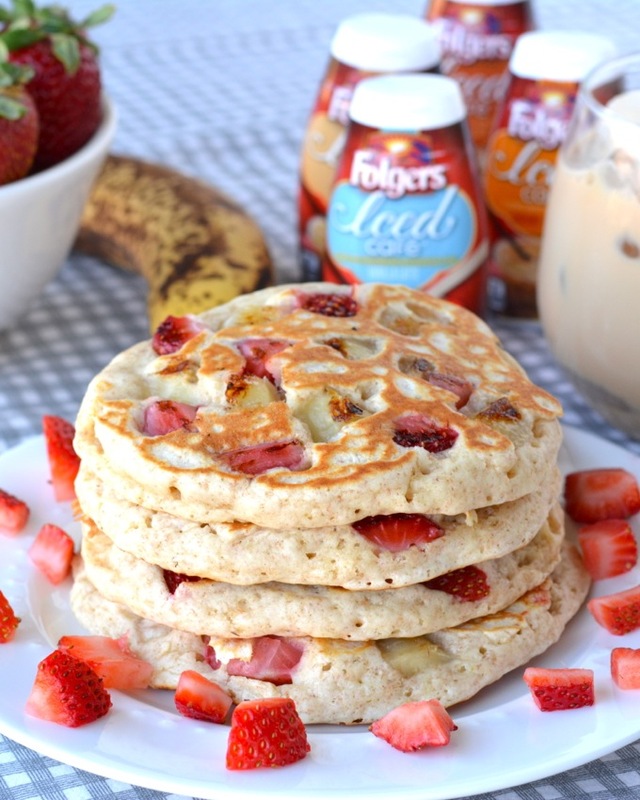 Strawberries and banana is such a great flavor combo! In a large bowl, combine the flours, baking powder, salt and sugar. In another bowl, whisk together the milk, egg, butter and vanilla. Whisk the wet ingredients into the dry until smooth. Let the batter rest a few minutes. In the meantime, heat a large, dry nonstick skillet over medium-high heat. When the pan is hot, pour a ladle full of batter into the pan. 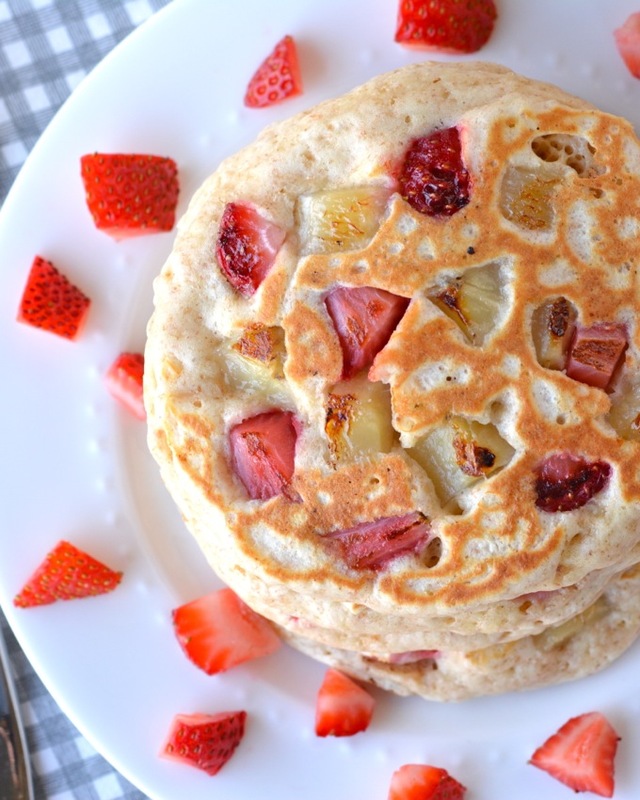 Sprinkle some diced strawberries and bananas onto the batter. Cook until bubbles form in batter, then gently flip the pancake and cook until cooked through and browned. Serve topped with extra fruit and maple syrup. To stay up to date on all the newest Folgers® products, be sure to connect with them on Facebook and Twitter! 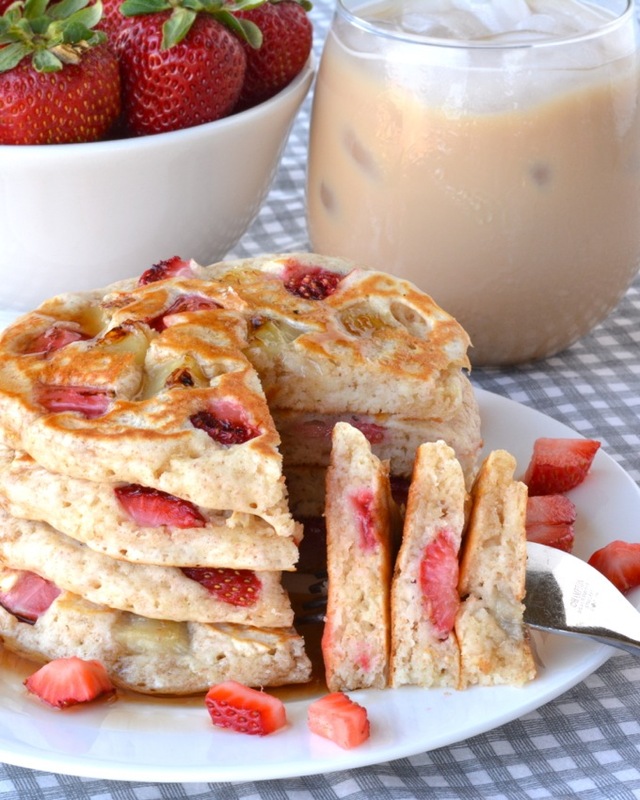 These pancakes look divine – love the strawberries. Definitely need to try these soon! Thanks, Jess! They were soooo perfectly fluffy! Do you deliver?! 🙂 I want a stack of these right now! I love all the great pancakes recipes I’ve been seeing lately! They are such a great base to do so much with! Your pancakes look so delicious! Me too, Shelby! So many fun mix-in and topping options. 🙂 These ones were so yummy! It’s hard to believe it is not officially summer yet. It has been so hot! I LOVE iced coffee when the weather is hot and I love pancakes any day of the year. Yours look fabulous. Love the strawberries! Thanks, Christin! Pancakes are definitely the best! These pancakes look fantastic! 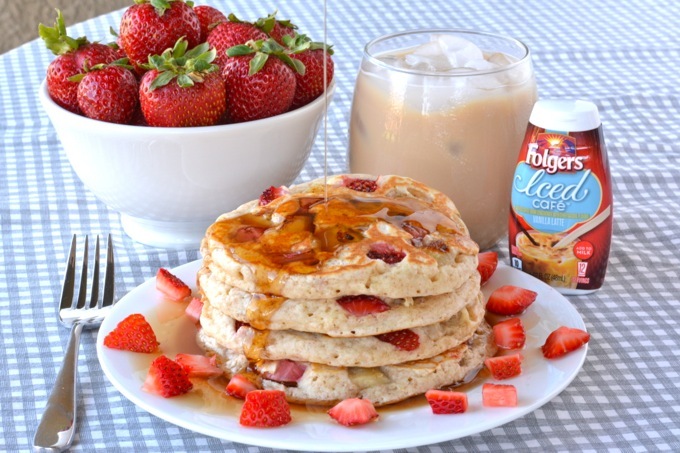 I absolutely adore putting fresh fruit in my pancakes, and I know they would go perfectly with a big ol cup of coffee. What a perfect summer breakfast! They look delicious. I love everything with strawberries! Muffins, pudding, pancakes, pizza. I`m kidding… But anyway great recipe. I was thinking to make my own pancake recipe tommorow so, now I`m convinced it`s a must. These pancakes look gorgeous! I love all those pretty strawberries! Totally one of my favorite summer fruits 🙂 Wish I had a stack now!